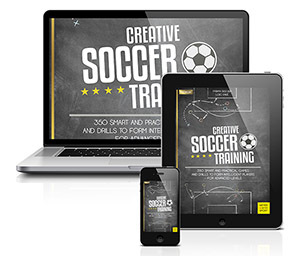 This book is considered a sequel to the book The Soccer Games and Drills Compendium. 350 Smart and Practical Games and Drills to Form Intelligent Players–For Advanced Levels, published in 2016, and its content and quality build on that of its prequel. 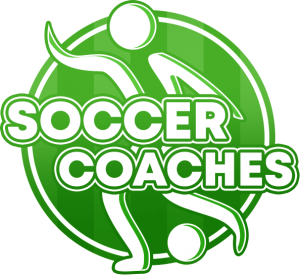 In The Soccer Games and Drills Compendium is fundamental training content such as passing, dribbling, shots on goal, feints, juggling, and dueling. Additional key subjects are transitioning and reacting, chaos and action, different ways to start a game, active defense, tournaments, tactical exercises, and athletics. 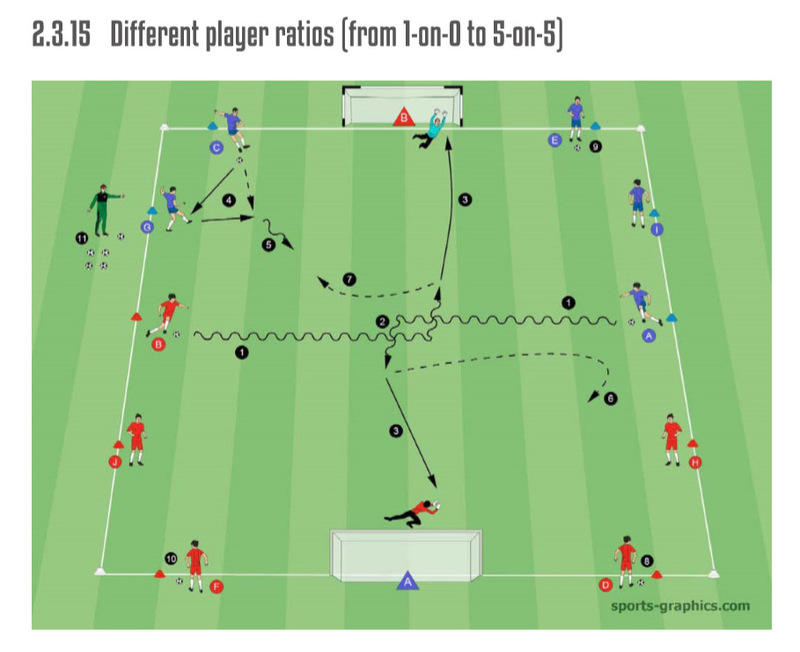 350 Smart and Practical Games and Drills to Form Intelligent Players–For Advanced Levels, the authors continue their realistic training approach and differentiate the key aspects of basic and classic soccer training. After completing an opening technique in the form of a dribble and a shot on goal, the different game situations begin. The BLUE team always attacks goal A and the RED team always attacks goal B. Players A and B simultaneously start the opening technique and, after a signal from the coach, dribble toward each other (see 1). Players A and B dribble past each other (see 2), turn left toward the respective opposing goal, and both ﬁnish on that goal (see 3). Next, the coach chooses one of the four players waiting outside with a ball, one at a time (see players D, E, and F). 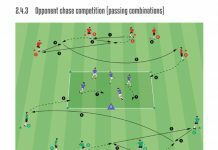 After completing a predetermined passing sequence (see 4), the ﬁrst player chosen (here player C) moves into the ﬁeld in possession (see 5) for the subsequent 2-on-1 on goal A. The outside players C, D, E, and F each get involved via a double pass with the outside players G, H, I, and J (see 4 and 5) positioned in front of them. After their shots on goal, the players A and B immediately transition and get into offensive (see 6) and defensive (see 7) mode for the next 2-on-1. After a goal is scored from the 2-on-1 or the ball has left the ﬁeld, the coach chooses the next player to immediately dribble into the ﬁeld via the predetermined passing sequence. One by one, the coach calls up the outside players C, D, E, and F, creating corresponding superior and inferior-number situations. After he has activated these four players he plays a pass to one of the four remaining outside players G, H, I, and J. The player receiving the pass settles the ball and dribbles into the ﬁeld. The three remaining players also start into the ﬁeld. A closing 5-on-5 situation ensues. Players are divided into multiple teams of two players each. There are two teams playing 4-on-2 on each of the two ﬁelds (see teams C/B and D/E). The players on each ﬁeld circulate a ball (see 1) and try to prevent a turnover via the respective defending players (see team A). Teams A and F are positioned at the starting positions outside the ﬁrst ﬁeld. The ﬁrst team (see team A) starts the ﬁrst action and both players run onto the ﬁrst ﬁeld without a ball (see 2) to intercept a pass (see 2) and to play the captured ball off the ﬁeld. After a successful capture, team A has fulﬁlled its task and remains on the ﬁrst ﬁeld for a subsequent action. The team that loses the ball (here team C) switches to defense and runs from the ﬁrst to the second ﬁeld (see 4) to try to win the ball from teams D and E in possession on the second ﬁeld. Meanwhile the coach brings a new ball onto the ﬁrst ﬁeld and teams A and B begin to circulate the new coach’s ball in their own ranks without an opponent. After team C has won the ball on the new ﬁeld (see 4), a new team F (see 6) starts from the starting position to capture the ball from teams A and B on the ﬁrst ﬁeld. After team C captures the ball, the team losing possession on the second ﬁeld (see team D or E) leaves the ﬁeld and takes over starting position F.
Team C remains on the second ﬁeld with the team in possession (see team D or E). Right away the coach also brings a new ball into the game on the second ﬁeld. After ten successful passes in 4-on-2 without the opposing team touching the ball (see team A on the ﬁrst ﬁeld or team C on the second ﬁeld), the team not in possession (see team A or C) must change to the other ﬁeld without a ball to try to capture the ball there.